Edit HTML pages quickly and efficiently with our user friendly WYSIWYG HTML editor. With our extremely lighweight and intuitive design you will find yourself using Free HTML Editor over our expensive cumbersome counterparts. Are you having problems making your website? Do you want a simple solution? A lot of people are having the same problems as you. No matter how much they desire to create their own website, they always fail because of the lack of a good HTML editor that can help them easily build their The Free HTML Editor shall provide you with one perfect solution. Developed by a team of software programmers who want to share to the ordinary people how to easily build their Web pages, the HTML Editor is an easy to download, easy to install and easy to use software program containing all the basic essential tools to come up with a working website. You can create your website fast and you can create as many websites as you can once you are able to follow how to make use of this HTML Editor. The Free HTML Editor which has a beautiful design because of its royal blue color has two parts. The first part on the left portion is where you will enter the HTML Codes and the second part of the HTML Editor is the output website. As you enter the HTML Codes on the left side, the resulting website created will be reflected immediately on the right side of the screen. This is very convenient because you do not have to press any other key in order to view the resulting webpage. You can easily find errors in your HTML Codes and you can easily correct the errors as they come. This is very convenient and very helpful as it cuts the time for developing a website. On the upper part of the Free HTML Editor is the easy to access tool bar containing all the tools that you need in editing your HTML Code. It has buttons such as the New, Save, Open, Undo, Redo, Find, Cut, Paste and the tools which gives you the options where you can open the Website in Google Chrome, Microsoft Internet Explore, Fire fox, Opera and Safari Browser. It contains all the kinds of Internet Explorer options from which you can open the website you created. You do not need to use many HTML Editors just so you could see the resulting website for each kind of browser. You have it all in the Free HTML Browser. Making your own website has never been fun and easy. 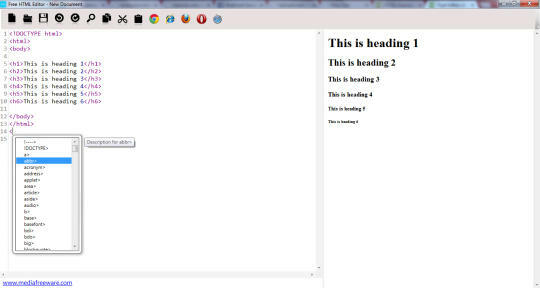 Thanks to the Free HTML Editor, you will never be lost again in making your own website. You can do this in just a few hours of time. You will just see yourself creating, developing and enhancing your Website with ease and convenience without the stress and the worries that came with a faulty HTML Code and a hard to manage HTML Editor. So to start experiencing it now, download the Free HTML Editor and make your best website fast. This has never been this easy. Now everything you need to build a website is in your hands.